It's no wonder public sentiment is starting to lean towards Senate abolition. Over the past month, we've learned about the RCMP believe that Senator Mike Duffy had a "pattern of filing fraudulent expense claims." We were also provided details about Senator Mac Harb and the RCMP alleging that he claimed an "uninhabitable home" as his primary residence. 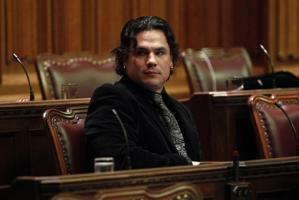 Now it's Senator Patrick Brazeau's turn in the spotlight. In an affidavit filed in an Ottawa court on Thursday, the RCMP allege that the former Conservative — now independent — senator inappropriately claimed his father’s home in Maniwaki as his primary residence in order to claim a $22,000 a year taxpayer funded housing allowance. According to Senate rules, "senators, whose primary residence is located more than 100 kilometres from the [National Capital Region], are entitled to a reimbursement of travel expenses, and a reimbursement of living expenses, while in the NCR for Senate business." The Mounties, however, say Brazeau didn't live in Maniwaki — he lived in a rented home in Gatineau just less than 10 kilometres away from Ottawa. "I do not believe that Brazeau’s primary residence is in Maniwaki," RCMP Corporal Greg Horton wrote in the affidavit, obtained by CTV News. "I believe that declaring that his father’s residence as a primary residence, while filing expense claims for a rental home where he actually resided, constitutes an offence of Breach of Trust." According to CTV's Mercedes Stephenson, police are also looking into whether Brazeau was claiming an on-reserve tax exemption while living in Gatineau. In addition to the potential legal action and maybe a call from the tax man, Brazeau is also facing administrative penalties from the Senate. In May, a Senate finance committee asked that Brazeau repay $48,744 for housing claims; he refused to do so. According to Postmedia News, Brazeau is claiming that he "met all four requirements the committee had to prove his residency — a driver’s license, health card, voter’s card and income tax return showing his primary residence was in Maniwaki." Brazeau, of course, is also the subject of another court proceeding. The Stephen Harper appointee was charged with both assault and sexual assault for an incident at his home on February 7th. According to court records, an argument about aboriginal issues turned to a violent altercation in which Brazeau allegedly aggressively grabbed the female complainant's breast and pushed her hard enough to break the handrail of the staircase. The charges have not been proven in a court of law. His next court appearance is scheduled for October.